"Chief Architect Open Forum Q&A"
If you have questions about anything to do with Chief Architect join us for this open forum Q&A session. 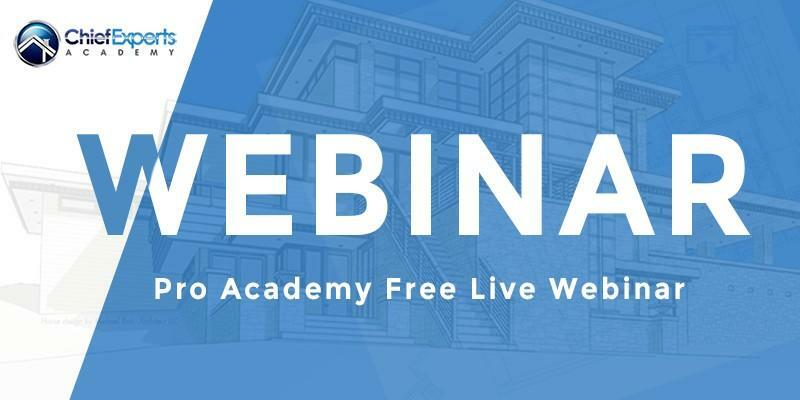 Dan Baumann and John Schrader with Chief Experts Pro Academy presents a free, live 60-minute webinar approximately once per month. Q&A is encouraged so allow an additional 30-minutes. How Often Do You Do These Webinars? Dan Baumann a 25-year Chief Architect user and training veteran will be your host. Sometimes Dan will invite a guest speaker to present topics other than Chief Architect. Are The Topics Always About Chief Architect? The mission of Chief Experts Academy is to give you the education and tools you need to create better plans and derive more profits from your design efforts. Along with Chief Architect training, look for other topics that will help you in your business. The live portion of these webinars are free. Where Can I Watch The Recordings? The recording of this webinar and many others are available in the Pro Academy member's area at Chief Experts Academy. Find out more here. When you enroll for this or any of these free webinars, you will also be added to our recurring webinar list. If you're not sure you enrolled, it's okay to register again. You will not be added to the list multiple times. How Will I Be Notified Of New Webinars? Each time a new presentation is announced (about one per month), you'll be notified via email from Chief Experts Academy. You will also receive a reminder 1-day and 2-hours before each live webinar from the Citrix webinar software we use. You will also be added to our email list, and we will occasionally send you updates and tips. What Do I Do If I Lost My Login Email? If you're enrolled you will be notified 1-day and 2-hours before each webinar via email that includes a login link. Be sure to check your spam folder. If you still can't find the link Contact Us and we'll give you a hand. You can opt-out at any time by clicking the link at the bottom of any of the emails from Chief Experts Academy and Citrix GoToWebinar. Enter your name and email to register for this and all of our free recurring live webinars. You'll be notified 1-day and 2-hours before each event. Opt-out any time. We respect your privacy. We will never share your information to any third party.